The CMS Grammar School in Bariga, a suburb of Lagos in Lagos State, is the oldest secondary school in Nigeria, founded on 6 June 1859 by the Church Missionary Society. For decades it was the main source of African clergymen and administrators in theLagos Colony. The seed funding for CMS Grammar School, Lagos was made possible by James Pinson Labulo Davies who in April 1859 providedBabington Macaulay with £50 (equivalent of ₦1.34 million as of 2014) to buy books and equipment for the school. With the seed funding Macaulay opened CMS Grammar School on June 6, 1859.In 1867, Davies contributed another £100 (₦2.68 million as of 2014) toward a CMS Grammar School Building Fund. Other contributors to the CMS Building Fund were non Saros such as Daniel Conrad Taiwo AKA Taiwo Olowo who contributed £50. Saro contributors also included men such as Moses Johnson, I.H. Willoughby, T.F. Cole, James George, and Charles Foresythe who contributed £40. The CMS Grammar School in Freetown, founded in 1848, served as a model. The school began with six students, all boarders in a small, single story building called the ‘Cotton House’ at Broad Street. The first pupils were destined to be clergymen. The curriculum included English, Logic, Greek, Arithmetic, Geometry, Geography, History, Bible Knowledge and Latin.The first principal of the school was the scholar and theologian Burlington Macaulay, who served until his death in 1878. He was the father of Herbert Macaulay. When the British colony of Lagos was established in 1861, the colonial authorities obtained most of their African clerical and administrative staff from the school. The leaders of the Methodist community, including Charles Joseph George, met in 1874 to discuss founding a secondary school for members of their communion as an alternative to the CMS Grammar School, Bariga Lagos. After a fund-raising drive, construction of the building commenced and the Methodist Boys’ High School, Lagos building was completed in June 1877. On March 14, 1878 the new school was formally opened, with Rev. W. Terry Coppin as the first principal of the school. The first batch of students was taken in in April 1878. There were 12 names on the roll. Among the twelve boys was George Stone Smith, the first on the list and therefore the Senior Foundation Scholar. There were in addition to these twelve boys, six mission agents-in-training. By the end of the year the number on roll had increased to 23 boys and 7 agents and work had commenced in earnest. Methodist Boys’ High School, Lagos thus became the second secondary school in Nigeria, after the CMS Grammar School, Bariga, Lagos founded in 1859. MBHS Lagos and CMS Grammar School, Bariga, Lagos subsequently teamed up to provide take-off students for Igbobi College, Yaba, Lagos founded through collaboration of the Methodist Church Nigeria and the Anglican Communion in Nigeria, in 1932. Beyond the school motto, the school slang – Dada o l’ogois popularly used for salutation among the current and old boys of the school. There is a long history about the slang of the school and it is still in use to date, spoken and whistled, in the school and among the old boys. The school’s history can be traced to the establishment of First Baptist Church Mission in Lagos by an African-American missionary. The mission was given a parcel of land by Oba Dosunmu and structures were soon built on the land. Educational activities started after the completion of the buildings and the expansion of missionary activities led to a gradual growth in the school’s population. By 1886, the school had about 129 boys and 95 girls in the primary section and about 14 boys and 3 girls in the secondary section. Prior to 1926, American pastors of the Baptist Mission acted as principals for the school but in January 1926, Eyo Ita and E.E. Esua joined the staff and in August of the year, Ita became the headmaster. The initial venue of the school was on Broad Street, Lagos and later moved to a new location along the Ikorodu Road, Lagos. The primary section was closed down prior to the movement to Ikorodu Road. The Scottish missionary Mary Michell Slessor, who had done much work with the Efik people around Calabar, was a driving force behind the establishment of the Institute.Edinburgh was hesitant about accepting Slessor’s demand to establish an industrial training center, but eventually decided to set up an institute on similar lines to its two existing ones in Africa, Lovedale Institute in South Africa and Livingstonia in Nyasaland. Robert Laws, a United Presbyterian minister who had been involved with both of these institutions for a long time, was sent to make a feasibility study. Laws expressed complete confidence that the success of the other two schools could be replicated in Calabar. The institution was established in 1894.The first school building was a prefabricated classroom block of corrugated iron sheets and Scandinavian pitch pine, built by a Glasgow firm and shipped to Calabar where it was assembled in 1894. By March 1895 teaching had commenced. By 1900 the school had forty-two students. Two were doing gardening, five printing, eight tailoring, five engineering, eleven carpentry and eleven baking. According to Henry Carr the boys were “well disciplined, and their appearance… cheerful and healthy.” They generally spoke English well and had good penmanship. However, the instruction programs were somewhat haphazard, dictated by whatever job the department was undertaking at any given time. SAINT Annes School was established in 1869 by the Church Missionary Society (CMS). The school was established specifically for girls. It was initially called CMS Girls School and later became CMS Girls’ Seminary. Thus, it can be said to be the oldest girls’ school in Nigeria. It was, however, moved to its present site from Lagos and having been merged with Kudeti Girls School, Ibadan, it metamorphosed into St. Annes School in 1950. St. Annes School can be said to be the forerunner of all girls’ schools in this part of Nigeria. This is because, many other schools evolved from it. For example, St. Margaret’s School, Ilesa; Yejide Girls’ Grammar School, Ibadan and Fiwasaiye Girls’ School, Akure are some of the schools which owe their evolution and existence to Saint Annes. All these schools can be referred to as St. Annes’s sister-schools. Indeed, all the founding principals of these schools, started as teachers and pupils from St. Annes. Thus St. Annes on The Hill, as it is popularly referred to, has a great history, as the mother of several other schools. Predictably, St. Annes School has produced many of Nigeria’s women trailblasers. Women like late Lady Kofo Ademola, the first Nigerian female graduate; Mrs. Tejumade Alakija, the first Nigerian female science graduate; late Justice Roseline Omotoso, the first female Chief Judge in Lagos State; Mrs. Dorothy Akanya, the first female Commissioner for Health in the former Northern Region; Prof. Jadesola Akande, the first female Vice Chancellor of a state university; others are: Rtd. Major General Kale, the first Nigerian female Major General (She is a Medical Doctor); the late Mrs. Flora Nwapa-Nwakuche, the first Nigerian female novelist; late Justice Atinuke Ige, the first female Judge in the then Western State; Prof. (Mrs.) Bolanle Awe, the first Nigerian female Professor of History; Dr. (Mrs.) Ngozi Iweala, a former Director in the World Bank and former Finance Minister in Nigeria. Needless to say, this list is endless. The school was founded by missionaries, who laboured for all, in the hope that Nigerian girls will be sustained in the light of the Holy Spirit. Thus pupils of the school are taught to labour right from their first day in school, in order to serve their country, with all their strength and faith. They are taught that it is their sacred responsibility to transmit the culture of the school wherever they are, so that all will know that they have integrity and are well trained. St. Annes products are not only taught to be industrious, but to also work hard on anything they lay their hands on and be well organised. They are also taught to be independent and be willing to help all those around them, as it is the school’s tradition. It is expected that a St. Annes product will have an open mind and be prepared to help others. The school’s motto Courage, Modesty and Sincerity are expected to be upheld by its products. The symbols on the school’s crest are the Dove, the open book is the Bible and the Palm Tree. The Dove is a symbol of the Holy Spirit. The open book is the Bible for it is the Holy Spirit that opens life, with its light for all. The Palm Tree, is a common tree that grows in the rainforest areas of Nigeria. No part of the palm tree is useless, hence it is a unique and outstanding tree. The bold lines on the crest represent Rivers Niger and Benue of Nigeria. The Patron Saint of the school is Saint Annes, who, is regarded as the mother of the Virgin Mary. Her feast day is July 26, hence the school’s birthday. St. Annes is also said to be the patron saint of miners. There are six houses in the school and each house has its own colour. They are St. Catherine (Red); St. Claire (Yellow); St. Faith (Green); St. Hilda (Brown); St. Mary (Blue) and St. Margaret (Orange). Each house celebrates its birthday by entertaining the whole school for a week. St. Catherine’s birthday is April 30; St. Claire’s August 12; St. Faith’s October 6; St. Hilda’s November 7; St. Mary’s March 2 and St. Margaret’s June 10. “I have only been able to record very few of the very many happy hours I have spent in the lab, classroom, chapel and stadium, encouraging people to think harder, search more diligently, jump higher, speak kindlier, forgive more freely, tolerate more widely, care more deeply and work for the common good and tell you of the joy it had given me when they succeeded”. Every August, the school holds its annual Arts festival. It is usually very interesting and entertaining. Different types of activities are competed for, by all the houses. We had competitions in various areas like singing (solo, duet and choir); traditional dances, writing, hair plaiting, choral music etc. This was how I got to learn many of the traditional and folk songs I know today. At the end of the competition, the houses that came first, second and third were given trophies. At the same time, competitors that came first, second and third are also given gifts for their respective efforts. We had a natural amphitheatre where the nativity play was performed every December, before vacation. The atmosphere was so real, that Bethlehem, where Jesus was born was virtually recreated. We also had our carol service at the amphitheatre. It was compulsory for us to learn new Christmas songs, as each class must sing a new Christmas song. In my own class, our French teacher (Ms Potts) taught us French Christmas songs and we became the envy of everybody, as we sang with pride that our Christmas carol was not in English, like every other class. So, as the school turns 138 years old today, all old girls – Seminary and St. Annes alike should be proud of the school. It is apposite to remember a verse of our school song. This school was established in 1908 as a boy’s school by the Abeokuta District Church Council (Anglicans) with the motto “The fear of God is the beginning of wisdom”, the school welcomed all with a thirst for learning, discipline, and academic excellence without regard to race, ethnicity or religion. The Founding Fathers believed strongly in training both the body and the mind. It was their view that education should equip a student to use both his brains and hands effectively, to be a credit to his home, community, country and the world. Discipline and character training were fundamental to their mission, as they believed no meaningful success could be achieved without discipline and character training. In 1908, the Nigerian Acting Director of Education in Lagos, Henry Rawlingson Carr advised Governor Walter Egerton on a detailed scheme of education in Lagos.Carr’s suggestions and proposals were the basis for the formation of King’s College. Carr convinced the London Board of Education that King’s College’s education mission would not overlap but supplement the education initiatives of missionary societies. As a result, some authors regard Henry Carr as the “architect of King’s College”. On 20 September 1909 King’s School (as it was then called) came into being. There were 10 pioneer students which included J.C. Vaughan, Isaac Ladipo Oluwole, Frank Macaulay, Herbert Mills (from the Gold Coast), O.A. Omololu and Moses King. Oluwole was the first senior prefect of the school. The school building was erected and furnished at a cost of £10,001. It consists of a hall to accommodate 300 students, 8 lecture rooms, a chemical laboratory and an office. Throughout Northern Nigeria, Zaria has distinguished itself and remained a famous educational town. Indeed it is a model of academic excellence. Four years before the merger of the Northern and Southern protectorates into what eventually came to be known as the protectorate of Nigeria in 1914, Zaria already, for the first time in the North, had an educational institution patterned on the western model. This was 1910 the year in which Alhudahuda College, Zaria was born.The founders of the city, who are believed to be Gbagyi (Gwari) probably had a vision of what it was going to become when they coined out what came to be known as “Zaria” some centuries ago. Ijebu-Ode Grammar School, the “Dawn of life, The source of Light, and Beacon of Secondary Education” in the entire historical Ijebuland was founded on 20th January, 1913 by the C.M.S. (The Anglican Mission). It is today the oldest Secondary School in Ijebuland, the second oldest in Ogun State, the second oldest in the defunct Western State of Nigeria, and the second oldest among the AIONIAN Group of Schools. It was around 1892, (about forty years after Christianity came to Lagos, Ibadan and Abeokuta), that the Ijebu people could practice and openly declare that they are Christians. A feature of Christian Missionary then was acceptance of Western Education as an integral part of the spread of the gospel, and hence both grew together. The plunge into Secondary Education in Ijebuland in line with the examples of C.M.S. Grammar School, Lagos and Abeokuta, was taken by the C.M.S. Mission in January 20th, 1913 when Ijebu-Ode Grammar School was founded by the Rev. S.J. Gansallo, assisted by the Revd. J.A. Cole, Resident Pastors of St. Saviours Church, Ijasi and Christ Church, Porogun, Ijebu Ode respectively. They were both graduates of Durham University. They combined full-time pastoral work with part-time teaching. According to records, one of the earliest teachers was Pa D.M. Okusaga. The Motto then was, and still is – “NON NOBIS DOMINE” – “Not unto us O Lord”. The School took off with fourteen(14) foundation students, (this number increased to twenty-five(25) the same year), at the Ideyin, Ita-Ntebo Quarters, Ijebu-Ode private residence of Pastor J.B. Sadare (Esinsinade). After nine (9) months, the school was moved to the Ijasi Vicarage of St. Saviour’s Church, where it remained till the present site at Abeokuta Road/Obalende area of Ijebu-Ode was acquired. Founded as ILORIN COLLEGE, ILORIN (popularly called “ICI”) at the Gbagba city gate, Oke Adeta, Ilorin in 1968 by Hon. A.G.F AbdulGaniyu Folorunso Rasak, (SAN), The first lawyer in the pre-independence northern Nigeria. Professor (Dr). Shehu Jimoh was the pioneer principal of this highly popular post-primary, secondary institution. Popular both in sports and academic rivalry among other institutions like Ilorin Grammar School, GTTS, GSS, Mount Carmel Secondary School, all at Ilorin. This school has produced many successful alumni, notable are Senator (Dr.) Ishiaka Adebayo Saliman, Alhaji (Engr.) Amori Yahaya, Alhaji Umaru Saka Olumoh and so many others. Established in 1915 by the then colonial masters, it was the third secondary school to be built in Northern Nigeria and fifteenth in the country during that period. Apart from being the third in the then Northern Nigeria, Government college Katsina Ala has churned out prominent personalities who have contributed positively in various fields of human endeavour. Some reached the pinnacle of their carriers and have retired while others are captains of industries and technocrats and others are public servants that are still rendering services to this great country, Nigeria. 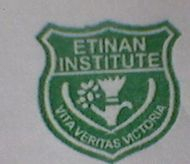 Etinan institute was established in 1915 by Qua Iboe Mission with Mr R.J. Taylor as the first principal. The present principal Mr Emeti E. Anana is the 28th principal of this prestigious institution. The school has 47 teaching and 15 non-teaching staff and the students population of 3427 in 68 streams (sections). The school is coeducational with 73 NYSC members, which makes the school one of the highest employers of corps members. The school has boarding facilities with over 500 students in the ratio of 50:50 male to female students. There are functional Physics, Chemistry, Biology, Agricultural Science laboratories, recently stocked with N3.5m worth of laboratory equipment donated by Exxon Mobil. There is a functional computer laboratory stocked with 100 laptop computers donated by Nigerian Communications Commission (NCC) with Internet facilities. The computer laboratory is furnished with 24 hours solar lighting system courtesy of NCC. This enables the school to teach computer studies effectively from junior secondary one to Senior Secondary one. It may also interest one to note that students offer computer studies and sat for it in the just concluded JSSCE 2013. The school maintains zero tolerance to examination malpractice and prepares students to move immediately into Universities as they finish their WAEC and NECO SSCE. The Old students of the institution include: 3 ex-state governors, a secretary to the Federal Government, a secretary to the State Government, a University Vice Chancellor, Commissioners, Permanent Secretaries among others too numerous to mention. Etinan Institute is still THE GOOD OLD SCHOOL! Ondo, the location of Ondo Boys’ High School, is about 54 Kilometres South of Akure, Capital of Ondo State. During the early periods of Colonial Administration in Nigeria, Ondo district was originally administrated from Lagos. Later a traveling Commissioner was stationed for a brief period at lgbo-Bini. In fact during the amalgamation of the Northern and Southern protectorates of Nigeria in 1914, Ondo was placed under the Resident at ljebu-Ode until the creation of Ondo province in 1915. The Presence of the Church Missionary Society (C.M.S.) was first felt in Ondo on December 24, 1973 when Revds, J.A. Masser and E. Operme to propagate the Christian religious doctrine. This was initially fruitless as the people never listened to the new gospel of the white man. However Christianity gained a foothold in the town with the arrival of Rev. David Hinderer on March 29. 1875. Rev, Charles Philips later came to wet the seeds of Evangelism which later grew and multiplied. The Church Missionary Society later paid a prominent role in the establishment of Ondo Boys’ High School, Ondo. After rapid growth of the Owu school to about 150 students,Reverend Samuel George Pinnock was directed by the Mission to set up a post primary school to educate children from the three feeder primary schools.In 1916 Pinnock identified and chose the site, Egunya Hill, and negotiated the purchase of the land. The building of the school was delayed because of the effect of World War I on the cost of building materials. However, in early 1922 Pinnock oversaw the construction of the Principal’s Quarters, which also doubled as Abeokuta Mission House; a block of five classrooms, a chapel, and a dormitory for boys. In 1922 Pinnock selected a group of advanced students from the three feeder primary schools at Ago-Owu, Ago-Ijaye and Oke-saje, and these formed the first class of the school. He opened Baptist Boys’ High School on January 23, 1923, with 75 students and four teachers (including his wife, Madora Pinnock). The opening ceremony attracted 2000 guests. The guest speaker was Professor Nathaniel Oyerinde, a teacher at the Baptist Academy,Ogbomoso, and Nigeria’s first Baptist Professor. The Church Missionary Society (CMS) of Great Britain founded Uzuakoli Institute (UI) in 1923, which later in 1931 was renamed Methodist College. Available information indicates that a group of missionaries led by Rev. Herbert Lewis Octavia Williams was the first principal of the institute. At various times from inception to 1959, British missionaries administered the college. These included Rev. Hardy, Rev. Carver, Rev. Aggrey, Rev. Woods, Rev. McGarr, William H. Spray, and B. Hall, who was the last missionary to serve as principal. The first Nigerian-born principal of the college was Kanu Achinivu. In recent history, the following men have served: Mr. Onokala, Mr. Anyaoha, Mr. Chukwu Ogbonnaya, Mr. Nwauche, Godwin O. O. Uzoechi, Mr C. N. Ukanwoke, Dr. Chukwumereije and Chief Sir Mike Emezue (D O B), who became the Principal of the College from 2008-2012. As a result of the handing over of some Secondary Schools to their original owners by the Abia State Governor, Chief T A. Orji, Methodist College Uzuakoli was returned to the Methodist Mission Nigeria on 14 September 2012. As of 2013 the principal was Rev. Best Okike. Methodist College is located on approximately 93 acres (38 ha) of land in Umuachama Amamba village, Uzuakoli district in Abia State. The college operated the Uzuakoli Leprosy Research Center, which was run and overseen by some of the same missionaries who served at the college. Rev. T.F. Davey from Great Britain led the foundation for the research center. DMGS was a late-comer in the comity of first generation schools. Others came decades ahead of us. In 1859, twenty years after the landing of the first missionaries in Yorubaland, the Rev. Thomas Babington Macaulay, the son-in-law of the Rev. Samuel (afterwards Bishop) Crowther, pioneered CMS Grammar School. In 1879 Methodist Boys’ High School was opened. Then followed St. Gregory’s College (by the Roman Catholics, 1876); then Baptist Academy (1886, by the American Baptist Mission); then Hope Waddell Institute (by the Presbyterians; 1895). Even the first government secondary school which was King’s College, Lagos -opened in 1909- came much earlier than DMGS. Queen’s College, one of the foremost Secondary Schools for girls education, was established on Monday, 10th October 1927. It came into being to bridge the gap created by the limited scope of secondary education for girls at that time. It is to the credit of the New Era Ladies Club, a group of enlightened women that the provision of secondary education similar to what was obtainable at King’s College must be attributed. The college was initially named Government Secondary School for Girls but changed to Queen’s College in Nigeria Gazette of April 12th, 1928, Government Notice No. 28. Miss F. Wordsmith who later became Mrs. Tolfree was the pioneer Principal. The college was first sited at Force Road near Race Course now called Tafawa Balewa Square but was moved to Lancaster Road, Onike, Yaba in Yaba Local Government Area its present location in 1958. Government College, Ibadan (GCI) is a high school for boys founded on February 28, 1929 on the Hills of Apata Ganga, Ibadan in Western Nigeria. The vision of the British founders was to groom future leaders of the emerging nation of Nigeria. There were 29 pioneer students who resumed classes on May 29, 1929. The school has boarding facilities and the five dormitories were named Swanston House (1929), Grier House (1930), Field (1948), Carr (1949) and Powell (1973). The colors are Blue, Maroon, Green, Orange and Purple respectively. As a result of the Second World War, the school was temporarily moved to another site between 1940 and 1945. GCI has produced a steady stream of proven scholars, top notch public servants, elected officials and captains of business and industry making legitimate contributions to the growth and development of Nigeria, Africa and entire world. All students were required to complete a number of core courses in the Arts and Sciences. The courses were designed so that all students, no matter what their strengths were, obtained the basic skills of critical thinking, effective writing, effective oral communication, library literacy, laboratory competency, creative thinking and problem solving. The school was a Centre of Excellence for cricket and field hockey. The school also had an Officer Cadet Corps that offered instruction camps in precision field drills, adventure training and the cadets were introduced to the principles of meritocracy. Barewa College is a college in Zaria, Kaduna State, northern Nigeria. Founded in 1921 by British Governor General Hugh Clifford, it was originally known as “Katsina College.”It switched its name to “Kaduna College” in 1938 and then “Government College, Zaria” in 1949 before settling on “Barewa College.” It is one of the largest boarding schools in Northern Nigeria and was the most celebrated post primary school in Northern Nigeria up to the early 1960s. The school is known for the large number of elites from the region that passed through the school’s academic buildings and counts among its alumni, five of whom were at one time Nigerian Heads of State including the late president Umaru Musa Yar’Adua. Memorable names of the dormitories include: Bello Kagara House, Luggard House, Clifford House, Dan Hausa House, Mallam Smith House, Nagwamatse House, Bienemann House, Mort House, and later Jafaru House and Suleiman Barau House, which were previously called New House A and New House B during their construction. These dormitories housed up to a thousand pupils at any one time, within the vast landscape east of Tudun Wadda. Twenty years after the establishment of Kings College, the first government-owned high school, by the British colonial government, three similar public schools were founded in 1929. These three institutions, Government College Umuahia (GCU), Government College, Ibadan and Government College Zaria (Barewa College), were designed to follow the traditions of British public schoolssuch as Eton, Harrow and Winchester. The GCU was known as the ‘Eton of the East,’ at that time because it was located in Nigeria’s orient and was known for its elite standards and selectivity. Rev. Robert Fisher was the founding principal of GCU. On December, 22nd 2014, a Deed of Trust was signed with the Abia state government, thereby vesting the Fisher Educational Trust with all legal interests, rights and power pertaining to ownership, management, operation, control and funding of Government College Umuahia. The trust was set up by the Old Boys of the College. Founded in 1931, Aggrey Memorial Secondary School is a co-educational secondary school which has gained a high reputation as one of Africa’s premier academic institutions. The school was founded by the Nigerian educator, statesman, activist and politician Dr Alvan Azinna Ikoku (1900–1971). Unlike many founders who would name institutions after themselves, Dr Ikoku named the institution after James Emman Kwegyir Aggrey (October 18, 1875 – July 30, 1927) who was a missionary and teacher from Ghana. In his journey to Nigeria in 1921, Aggrey made a significant impression and underscored the importance of education for human development. St Teresa’s College, Ibadan was founded in Lagos, in 1933 as a branch of St Mary’s Convent which had been founded in 1873.The College was named after Saint Teresa of Lisieux one of the founders of the Carmelite Teaching Order whose official colour was brown. It’s first location was at 72 Campbell Street Lagos and several of its first pupils were from St Mary’s Convent and it first Principal was Sister Brenda Hayes while Mrs Cyrilla Ajike Campos (nee Aherele) was the first native Nigerian to teach at the school. In 1946, St Teresa’s High School for Girls as it was known then, moved to it’s current location of Oke Ado, Ibadan, on the hill where its graceful prescence dominates until this day. The College was founded on the 14th of November, 1973 with a total student population of 80 and 10 tutorial staff. The pioneer class was form one, which was later followed by a lower six class in 1975. At inception, the college started with a few buildings some of which were inherited from Government College, Owerri. The inherited buildings were two laboratory blocks which house the Biology, Home Economics, Physics and Chemistry laboratories and four staff quarters, one of which was used as the administrative block. Edo College is a secondary grammar school in Benin City, Nigeria, the oldest in the Mid-Western Region. It was established in February, 1937 and started as the Benin Middle School with forms, I, II and III. In April 1937, the school, with a total student enrollment of 76 pupils, moved from its temporary site at the old Government School, Benin City to a permanent site, the present Idia College premises. In 1973, the school further moved from Idia College premises to its present site along Murtala Mohammed Way, Benin City. Edo state in the federal Republic of Nigeria. With the Government take-over of schools in the state in 1973, the management of the College went from the direct control of the Ministry of Education to the Board of Education with particular reference to the appointment and deployment to staff to the school.